We are an independent Chinese Medical Clinic and chinese medicine retail unit based in Chesham, Buckinghamshire. Concerned with helping all our customers reach the best levels of health, we pride ourselves on providing an excellent diagnosis and treatment of disease. There are 3 modalities of Traditional Chinese Medicine: Acupuncture, Herbal Therapy, and Tui Na Massage. All are useful to restore your health and improve your natural healing ability. Using a highly effective diagnosis, our doctor assesses each patient in terms of lifestyle, diet, medical history, work, emotional states, etc. to find the root cause of your problem. Our Chinese doctor has many years experience both in Chinese Hospitals and British clinics. 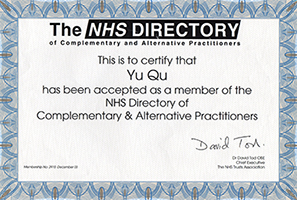 At The Healing Point all our practitioners are fully qualified, insured and registered with professional industry bodies such as the Association of Traditional Chinese Medicine, the NHS Directory and ITEC (Embody). We use only natural products from trusted suppliers who do not import endangered species, and herbal products that are tested to be free of contaminants. Our Acupuncture needles are 100% sterilised surgical steel and used once only. After a course of treatments many patients feel an surprising range of benefits; such as increased confidence, greater energy and enjoyment of life, and an increased ability to face the stresses and strains of daily living. To maintain health before symptoms appear we recommend regular treatments (every 1 to 3 months). Combined with a balanced diet and regular levels of exercise it is a good formula for a long and healthy life! "I have been attending Dr QuYu's clinic for asthma and overweight problems and have been delighted with the results so far." "Thank you so much for your treatments. They really did contribute to my well-being and me falling pregnant." "Helped with losing weight and sleeping better, and was able to stop smoking on my own. Very good treatment and very friendly and helpful." "My Headaches have reduced, I have lost weight and an allergy I had has gone. I have found that the holistic approach promotes general well-being and many health problems have gone"
"Treatment on osteo-arthritis of knee has been successful. I now walk pain free, also I have lost some weight and still drinking tea to lose more." "WOW! I have had treatment or my headaches and this holistic approach has done wonders! I feel so much better, thanks so much Qu Yu!" "I have suffered from IBS and headaches all my life. I feel so much better from my treatments and lost weight too, it has been wonderful." "The treatment I?ve received both for an ongoing problem after surgery on my leg, which in turn resulted in a lot of anxiety, have improved a great deal." "Suffered from asthma for 20 years, after 3 months of treatment symptoms are massively reduced. I have not needed my inhaler for 8 weeks having previously used daily. I would recommend this treatment to anyone." "I suffered from anxiety and very high blood pressure (150/100). After 1 1/2 months of treatment my anxiety has decreased significantly blood pressure is now 120/70, I feel so much healthier and happier! " "Not only have I stopped smoking but I feel generally better in myself. I would highly recommend it!" "I used to only sleep about 3 hours a night and was totally exhausted but now I sleep well and am full of energy!" "I can now sleep without pain in my thumb and my life is so much better. Thank You"
"My energy levels are so mucch better and the tension in my shoulders and the pain in my back has gone." "Shoulder much better - you're a genius!" "After suffering frequent hot flushes, I approached Dr Yu Qu for help. After 2 weeks of treatments I am definitely feeling much better and sleeping well"
"I was suffering from poltmyalgia- the improvement is astonishing. My doctor could only give me steroids or painkillers - no cure. I recommend Dr Yu Qu's skills and am taking her herbs back to New Zealand with me." "When I first came I was suffering from serious back pain. After a few treatments it was almost gone and I'm pleased to say as of today my back is pain free. Tried an osteopath before acupuncture, but acupuncture has definitely done the job and means I can now do my daily routine pain-free."